This recipe is an adaptation from Dawn of Simple Gourmet Cooking. I participated in a recipe swap with a group of girlfriends and when I got Dawn's blog, it wasn't hard to find something to make! I haven't featured many drinks on my site so this one was perfect for the season. Something I really liked learning is making a lemon simple syrup for this lemonade recipe. Usually I stir lemon juice with water, but by boiling the lemon juice and sugar together to create a syrup, the lemon flavor is even more concentrated and sweetened at the same time. Thanks for the wonderful tips and recipe Dawn! Juice the lemons (perhaps more) to yield 1 1/2 cups lemon juice. Reserve the rinds and place in a large serving pitcher with 5 cups of water. Place 1 cup of the lemon juice in a small saucepan over medium high heat and add sugar. Allow the lemon juice to come to a boil and stir until sugar is completely dissolved. Remove from heat and set aside to cool. This is the lemon simple syrup which will sweeten the lemonade. Combine the remaining 1/2 cup lemon juice with the raspberries in a food processor or blender. Process until well blended. Transfer mixture to the large serving pitcher by straining the liquid through a fine mesh sieve. Add the cooled lemon simple syrup to sweeten, adding more water to your tastes. I love the idea of using raspberries-one of my favorite fruits and flavors! So glad you liked it! One of my favorite drinks is the raspberry lemonade from Quiznos. It is amazing, and I'm sad to say that it has never crossed my mind to try to "make". Definitely will have to try and see if this measures up later this summer. Holy shizzle-balls - that looks GOOD! 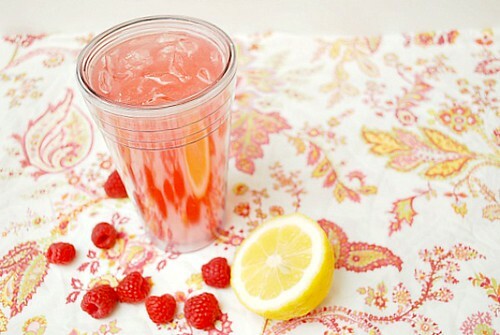 I rarely see lemons and raspberries paired together, but this drink looks too good to pass up. I'll have to remember to pick up all of these ingredients this weekend. What a delicious, looking refreshing drink to help keep cool in our blazing hot Chicago summer! :D My kids would love this! We just went strawberry picking and I have tons to use. Maybe I'll sub them in for the raspberries? I'm staring at a pile of lemons left over from a few dishes I made this weekend - think I see some lemonade in my near future! And I agree, the flavor combination of lemon and raspberry is just awesome! I could go for a glass of that right now. Yum! This looks so refreshing! I also want to jump into that picture, haha. So, if you were going to make an adult version of this, what would you add? I feel like raspberry and lemon could be the basis of a killer cocktail.